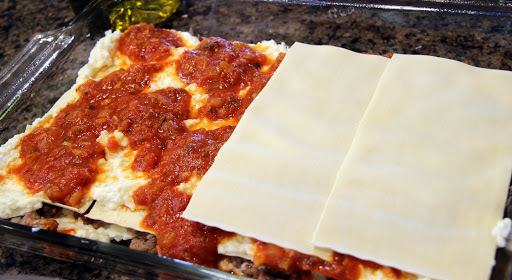 I recently got to spend a weekend with some of my favorite people in the world and I was very happy to take them this lasagne to share. 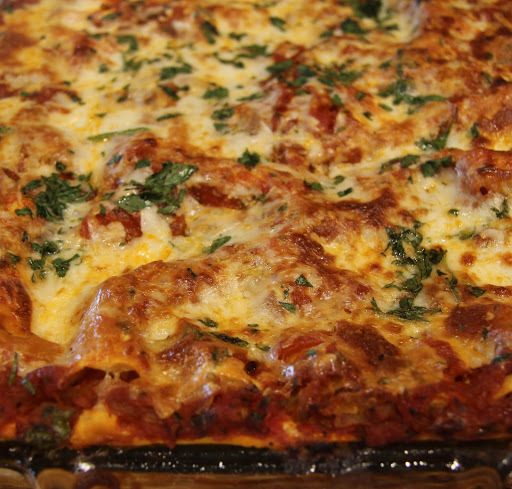 They were pretty happy about it too… Who doesn’t love lasagne?! My friend told me it may have been my best version yet so I promised her I’d share it here and show her just how simple this recipe is to make. With my multiples group, I participate in taking meals to families with newborn twins and triplets and this is one of my main go-tos. A lot of people sort of avoid it and try to come up with less common dishes but I tend to embrace it. 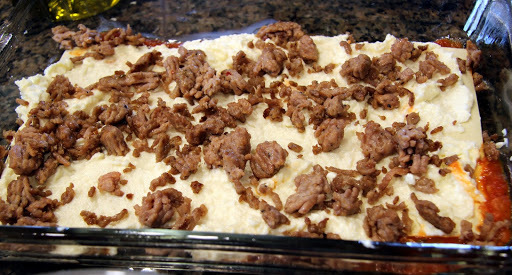 It’s cliche for a reason – it’s such great comfort food! 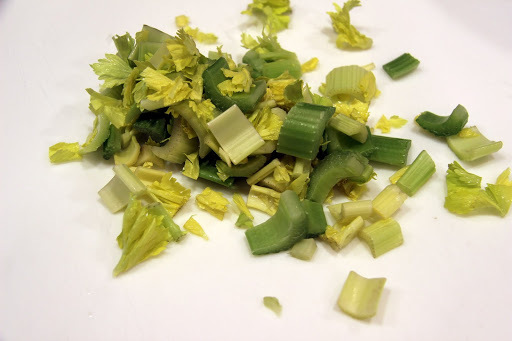 I always try to keep from overindulging by serving a reasonable portion with an extra large serving of green salad. It doesn’t always work but it helps. 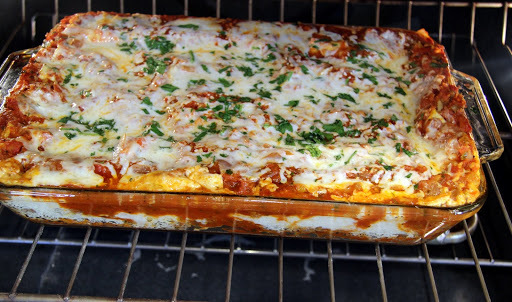 This recipe is adapted from the one on the back of the box of Barilla No-Boil Lasagne. All I really do differently is doctor up the sauce a bit. You can sneak in more veggies if you want by adding chopped bell peppers, mushrooms, spinach, etc.. I know this looks like a lot of steps, but that’s just because I’ve spelled everything out to make it easy for you to follow. Have someone else do the dishes when you’ve finished and it will be even easier! It’s the least they can do after you’ve made them lasagne. 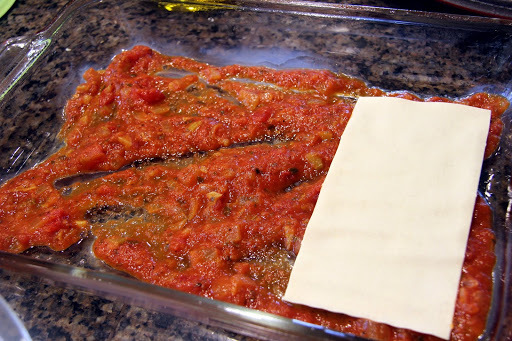 Preheat oven to 375 degrees, 350 degrees if using convection oven. 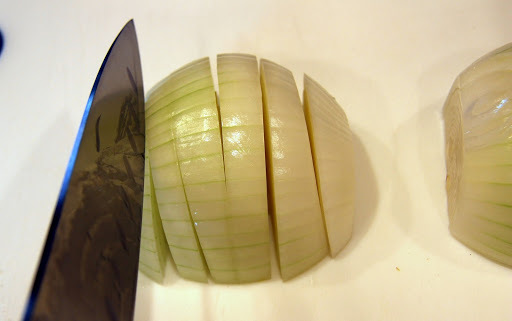 Peel, halve, and chop onion. 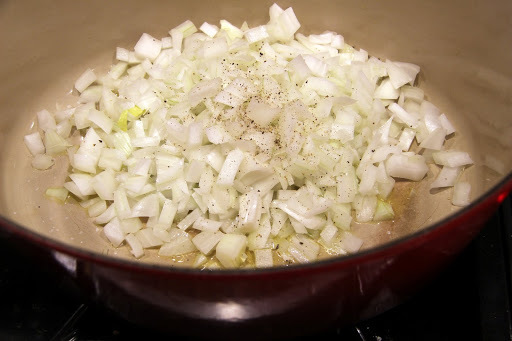 Place olive oil and chopped onion in large skillet or dutch oven. 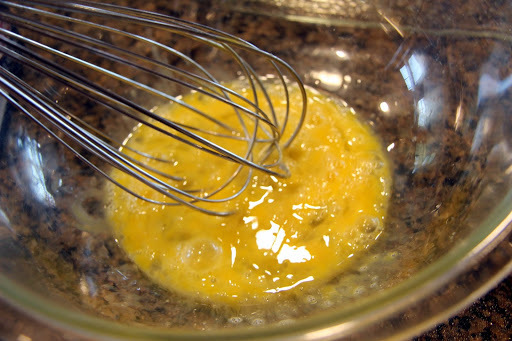 Sprinkle with salt and pepper and saute on medium heat, stirring occasionally with spatula. 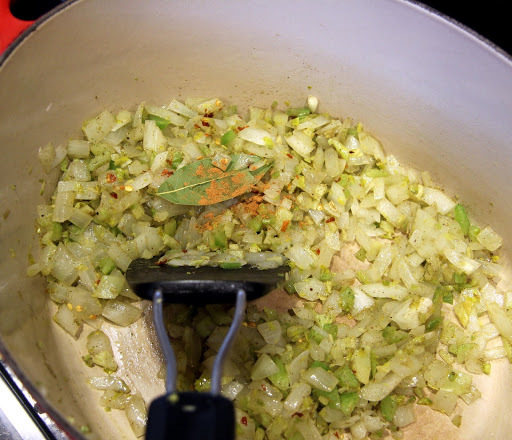 Add celery to onions along with oregano, fennel seed, bay leaf, red pepper flakes, cinnamon and bay leaf. 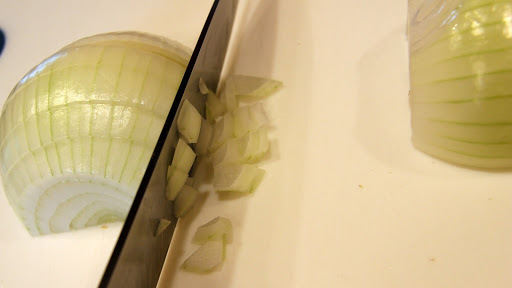 Stir and saute on medium heat until the onions are translucent and the celery begins to soften. 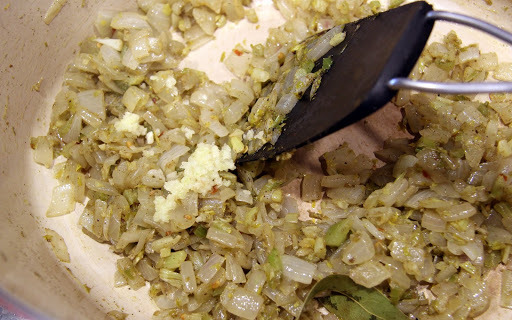 Stir in grated garlic. 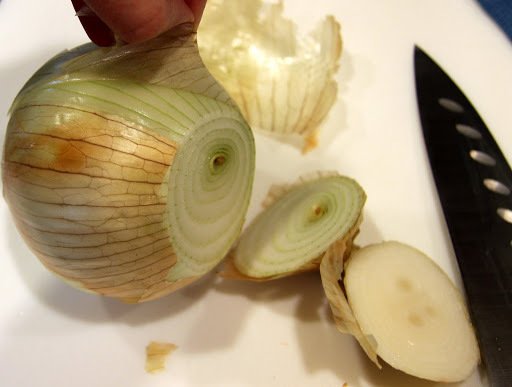 I always add the garlic toward the end of the saute process so it doesn’t overcook and become bitter. 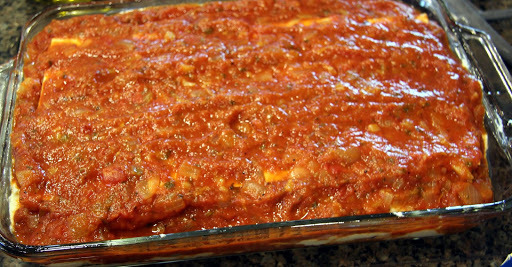 Add jarred sauce to pan. Make sure you choose a decent quality sauce that’s not loaded with sugar. 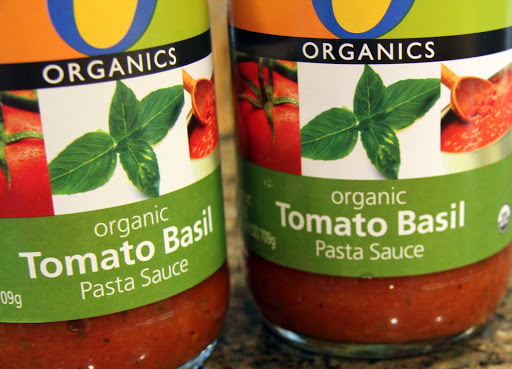 For example, Ragu Sweet Tomato Basil Sauce has 10 grams sugar per serving and Safeway’s O organic Tomato Basil sauce has 3 grams sugar per serving. 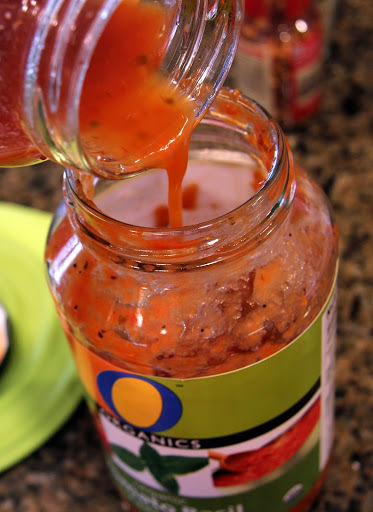 I also like Trader Joe’s Tomato Basil sauce. Add about a cup of water or red wine to one of the emptied jars, shake to get out excess sauce and transfer to other jar and repeat. Add to sauce mixture in pan. 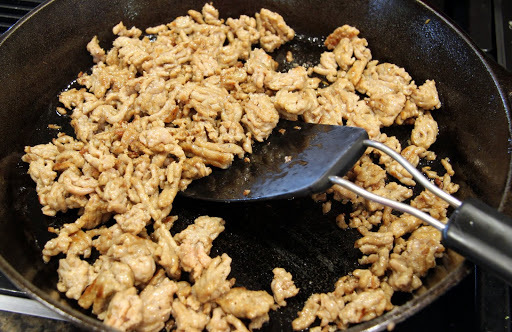 Allow sauce to simmer on low while you cook the ground meat in a skillet on medium-high heat, breaking up meat with spatula as it browns. 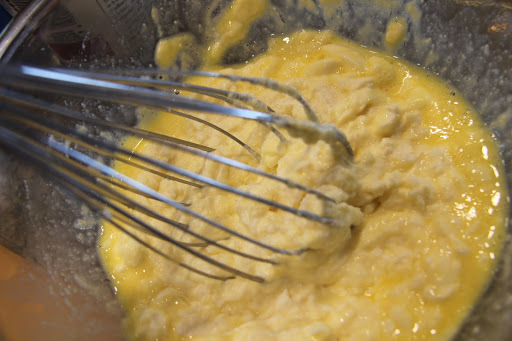 While meat is cooking, lightly beat eggs in a large bowl. 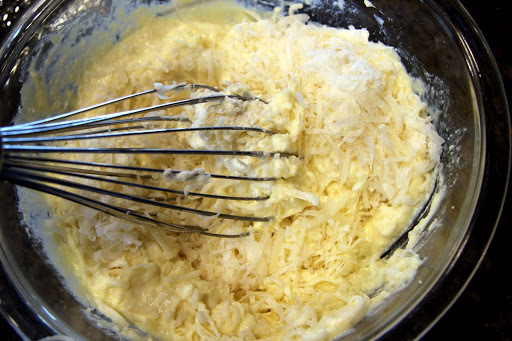 Stir in ricotta cheese, 2 cups of the mozzarella cheese (set aside remaining two cups for layering) and the parmesan cheese. 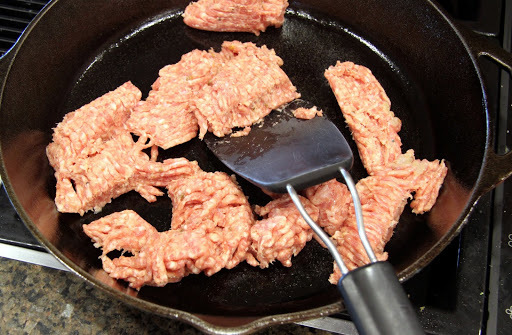 Once meat is browned, remove from heat. You can now begin layering! 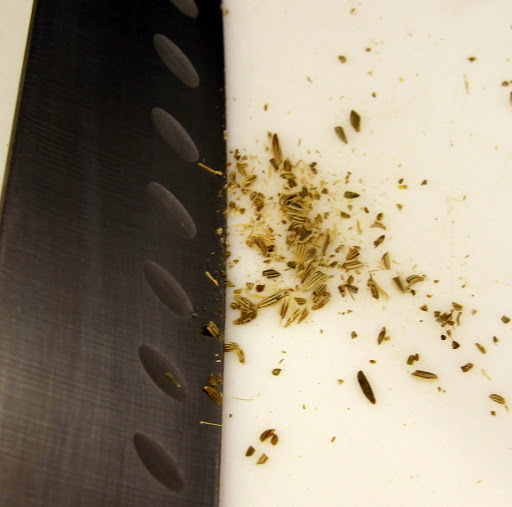 Gather your ingredients and spray a 13x9x2 inch pan with cooking spray. 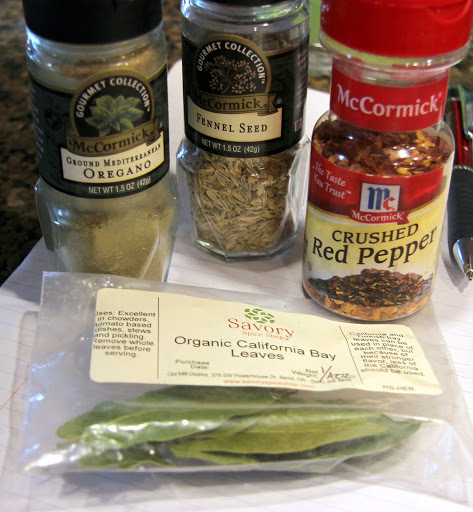 Remove the bay leaf from the sauce before you begin. 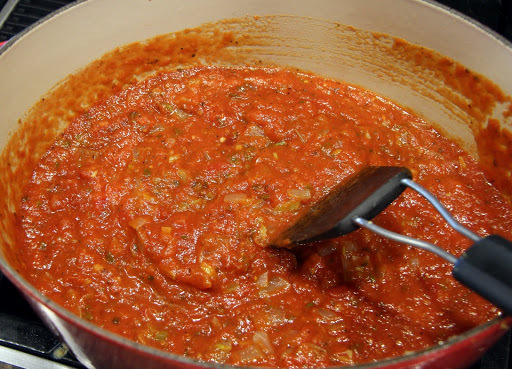 Begin by spreading one cup of the sauce on the bottom of the pan. 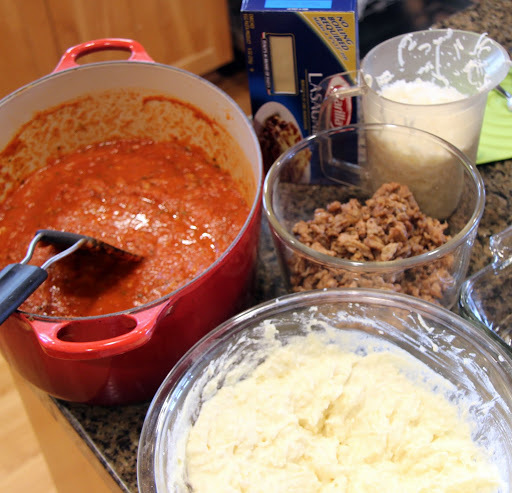 Next, layer 4 lasagne noodles, 1/3 of the ricotta mixture, 1/2 the browned meat and 1 cup of sauce. 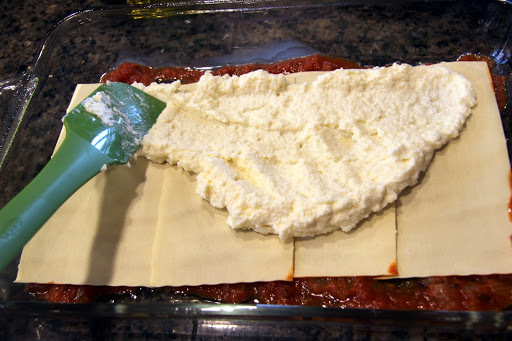 Layer 4 more noodles, 1/3 ricotta, 11/2 cups of sauce and 1 cup shredded mozzarella. 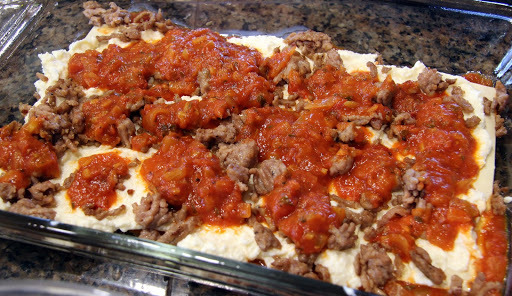 Next (not pictured), layer 4 noodles, remaining ricotta, remaining browned meat and 1 cup sauce. 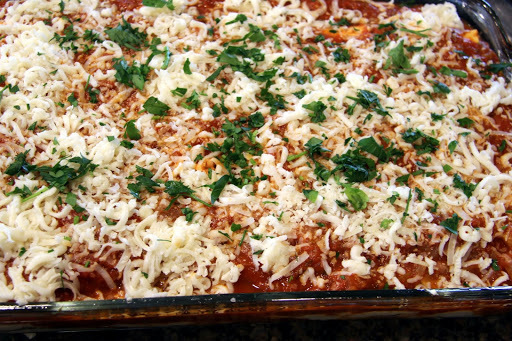 Finally, for the top, layer remaining 4 noodles, remaining sauce, remaining cheese and chopped parsley. 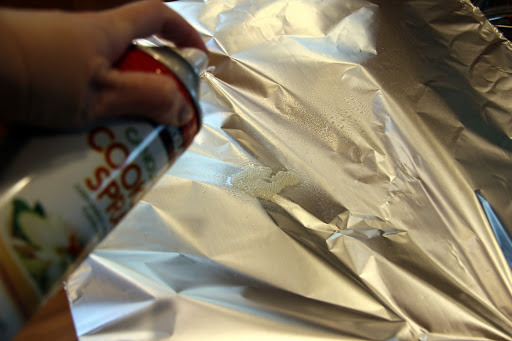 Before covering with foil (you’re gonna thank me for this), spray the inside of the foil with cooking spray so the cheese does not stick to it. Cover tightly around the edges but slightly tented on top (again, to prevent too much sticking). 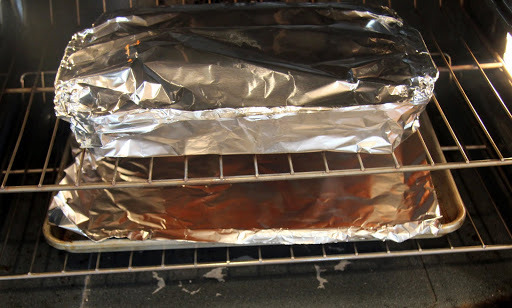 Bake covered for 50 – 60 minutes. I highly suggest a foil lined sheet pan below to catch any dripping that may occur. 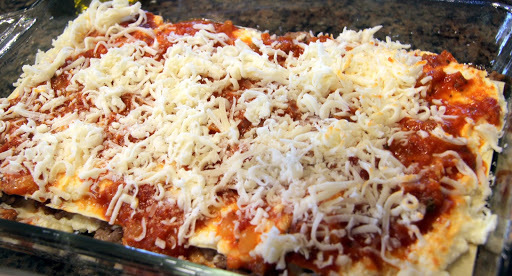 Remove cover and bake for an additional 10 minutes or until the cheese has browned nicely. 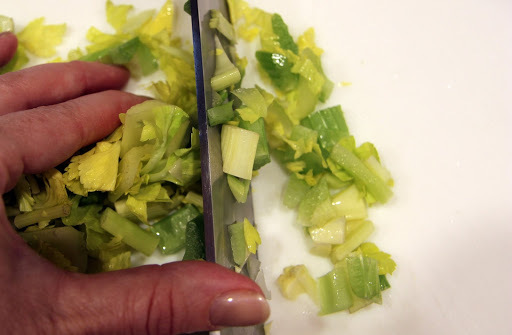 Allow to rest for at least 15 minutes before serving. 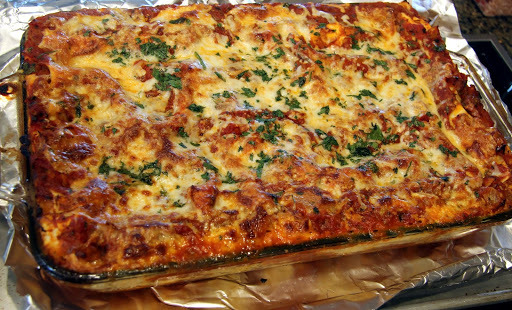 As you probably already well know, lasagne is often better the next day so go ahead and make it ahead of time. Also, it freezes beautifully which might help with your portion control if you don’t have several people to feed. Wise words to keep in mind as we celebrate Earth Day and every day in between… Remember to recycle those glass jars you just used :).